Do you feel nervous when you’re handling the older stuff in your library? 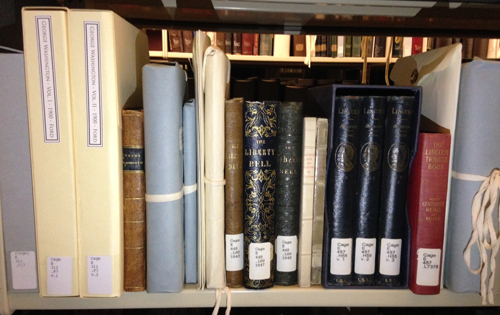 Do you wonder why some of the other older stuff isn’t kept with the special collections books in your library? Do you worry that maybe these items are not protected as well as they could be? This talk is for you! Join ISL Conservator Rebecca Shindel for a down and dirty rare books basics talk on Wednesday, August 10th, 3:40-4:30 p.m. where you’ll learn about what gives a book rareness or value, why some books are selected for special collections and others not, basic condition issues these books might have, how to handle and store older, fragile volumes with care, and how to keep your eyes peeled so you know when to sound the alert. This talk is part of the full day conference titled “The Difference is You: Your Service Matters!”, a conference that caters specifically to Indiana library staff members who do not hold a master’s degree. Held on August 10th, at the Indianapolis Public Library’s Central Branch, it is a deal at only 25.00 per registrant. And that includes lunch! Registration is available through the Indiana Library Federation, which is partnering with the Indiana State Library’s Professional Development Committee to produce this event. There is still time to register for the conference, but the deadline for registration is August 2nd. Click here to access this year’s brochure. If you have questions about Difference is You: Your Service Matters, please reach out to Kim Brown-Harden, at the Indiana State Library: kbrown-harden@library.in.gov.